John M. Palmer (1817-1900), Major General, USA. Participated at Island No. 10, Murfreesboro, Chattanooga, Atlanta campaign. Document Signed (DS), 1 page, large folio, April 1864 pertaining to estimate of clothing, camp & garrison equipage for the 14th AC. Signed by Palmer as Maj. Genl. Comdg. 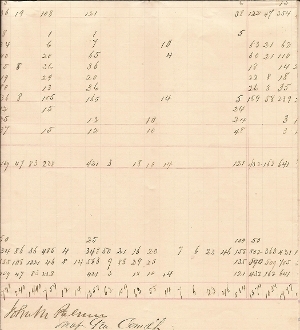 Number of Ohio, Indiana & Kentucky units are mentioned in the document.